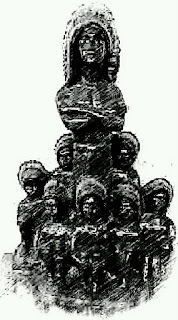 Within Espiritismo and Sanse there are Seven Legions of Indian Spirits, known as Divisiones also known as Comisiones. Each of the Divisions has its own Head Cacique Chief who in life could have had the title of Cacique "Chief" Bohiques "Priest" or Buhuitihu "Shaman.". Each of the Divisiones surrounds a native Angelic Force which has become part of the Celestial Court and is known as a Cemi. The Cemi is the name of the group of the Spiritual Forces the Taino venerated in life. Each of the Division has a following of legions known as the Naboria. The Seven Division of Spirits often fall under one of the seven categories. 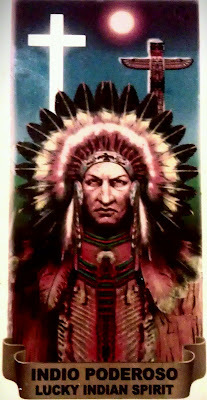 The Indios can be ones Centinela or part of ones Cuadro Espiritual. 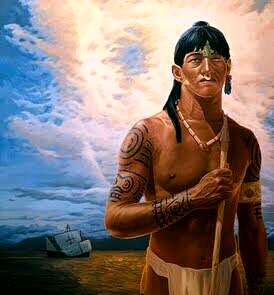 It is important to understand that while some of the Indios are Wise and Kind, some are aggressive by nature and very possessive and often overly zealous of the person they guard and protect. 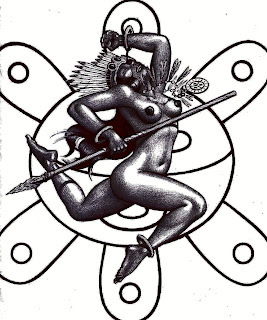 Being an overly protective spirit it is known within Espiritismo, Brujeria and Sanse circles that if anyone harms a person who is under the protection of an Indian Spirit they often unleash their wrath on the offender. This wrath comes in the form of accidents, bad luck, illnesses, anxieties and mental issues. 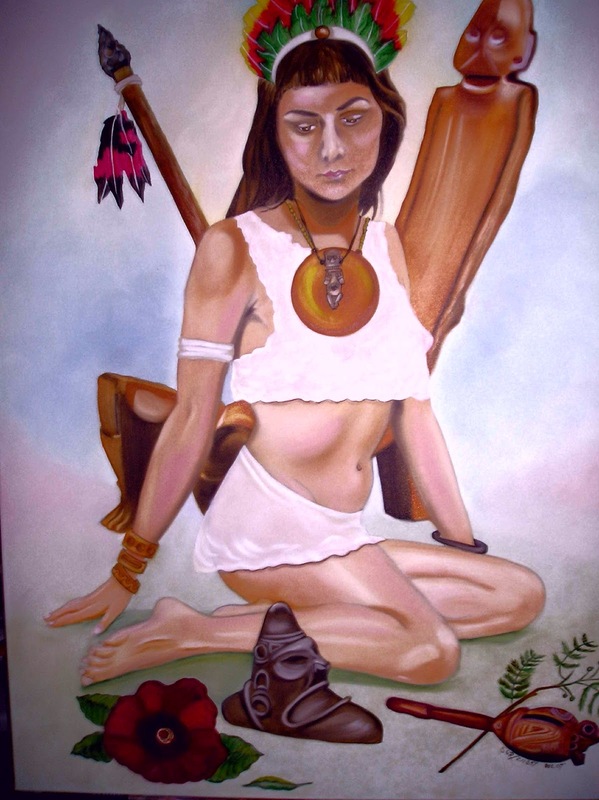 While I have seen many individuals keep their Indian paraphernalia and ritual items on the same Tableau Espiritual "altar" as their Cuadro Espiriritual This Commision should always be kept away from the other Commisions or on a shelf or altar all to themselves. I ask for Light, Progress, Love, Charity, and Elevation to the Commission of the Indian Spirits. May you have eternal peace as you are guided into the light buy he who represents you here on the material plane el Indio de la Paz. Oh Indio de La Paz I invoke you here and know, so that you may help me with the powers granted to you from God. Help me in finding peace and help me in resolving my earthly problems. May nothing nor no one under heaven disturb my peace of mind, my safety, and my sanity. Protect my loved ones, my home, my family and watch over my well being. May God's heavenly peace be upon you and your people, now and unto the end of time. Amen. Pido Luz, Progreso, el Amor, la Caridad, y la elevación a la Comisión de los espíritus indios. Que tengas paz eterna a medida que se orientan hacia la luz. Oh Indio de La Paz que se invoca aquí, para que me ayude con las facultades otorgadas a vosotros, de Dios. Ayúdame a encontrar la paz y ayudanme a resolver mis problemas terrenales. Que nada ni nadie bajo el cielo, perturbar la paz de mi mente, mi seguridad y mi salud mental. Protege a mis seres queridos, mi hogar, mi familia y vela por mi bienestar. Que Dios esté con usted y su gente, ahora y hasta el final de los tiempos. Amén. With the sign of the cross that I place over myself, in the Holy Name of the Omnipotent God I invoke you Indio de la Fuerza so that you may bless me with your strength to conquer those who wish harm upon me. Guard and Protect me from those who wish to cause me harm and may their evil desires return upon them three fold. In the Holy Name of el Indio de la Fuerza I ask that you consider what I ask of you and may I succeed in life. Amen. Con la señal de la Santa Cruz que pongo sobre mí mismo y mi cuerpo, en el Santo Nombre de Dios Omnipotente. Invoca al Indio de la Fuerza para que me bendiga con su fuerza para vencer a aquellos que desean hacer daño a mí. Guardia y Protégeme de los que quieren hacerme daño y que sus malos deseos se les volte sobre ellos tres veces. En el Santo Nombre de el Indio de la Fuerza, le pido que considere lo que yo le pido, y que yo pueda alcanzar el éxito en la vida. Amén. In the name of the Father, Son and Holy Ghost, oh Holy Trinity give light and progress to the Commission of Indian Spirits. In this moment and at the hour I invoke the sublime powers of el Indio Poderoso. May he free me of the deception of my enemies. 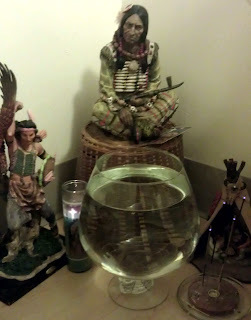 Oh Indio Poderoso I humbly pray that you protect and guard me against anger, anxieties and an untimely death. Bless me Oh Indio Poderoso with the wisdom and patience in helping those less fortunate and in need. Bless me with the strength needed to overcome the trials and tribulations of this life. I have faith in the power bested upon you by our Lord, and I humbly pray. Amen. En el nombre de Dios Padre, Dios Hijo y Dios Espíritu Santo, oh Santísima Trinidad, darle luz y progreso a la Comisión de los espíritus de los Indios. En este momento, y en esta hora invoco los poderes sublime de El Indio Poderoso. Que me libre de la decepción y envidia de mis enemigos. Oh Indio Poderoso humildemente le pido que me protegen y guardarme de la ira, la ansiedad y una muerte prematura. Oh Indio Poderoso concederme la dignidad y el poder para vencer. Que yo pueda ser bendecido con alimentacion y refugio. Bendíceme Oh Indio Poderoso con la sabiduría y la paciencia para ayudar a quienes necesitan, esos que son menos afortunados. Bendíceme con la fuerza necesaria para vencer las pruebas y tribulaciones de esta vida. Tengo fe en tu poder. Amén. 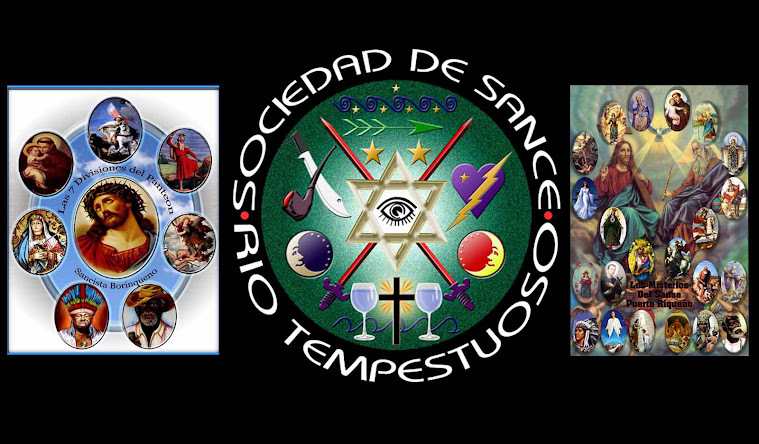 I come humbly asking with utmost faith in the Celestial Court of Spirits and Angels for enlightenment and elevation to the Spirit of el Indio de la Guerra. Oh Indio de La Guerra in this sacred hour and in this sacred moment I invoke thee, I invoke thee, I invoke thee. Attend to my supplication, Oh Great Brother and Warrior Spirit. With your Bow and Arrow, I ask that you eliminate, destroy and return to its sender and origin all form of invocations, black magic, sorcery, enchantments, curses, my enemies have set upon me. With your axe I implore that you break all knots, chains, or bindings that in my name they create. May all forms of Sortilege done under my name and without my consent be clouded within a thick shadow of secrecy. Your power is immense and I do not come to you without utmost respect and reverence. Assist me with this Spiritual labor and I ask that you destroy all obstacles and remove them from my path so that I may be liberated of all evil and danger. 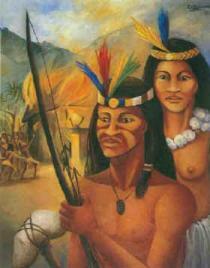 Indio de la Guerra your powers are immense, that you are able to bind the evil thoughts and wishes of my enemies. Bind the wagging tongues and return the evil eye to its sender. May all who wish me harm fear and respect the protection you bestow upon me. Amen. Yo vengo pidiendo humildemente con una gran fe en la Corte Celestial de los espíritus y los ángeles de la iluminación a la elevación del espíritu de El Indio de la Guerra. Oh Indio de La Guerra en este momento solemne y en este momento sagrado yo te invoco, Yo te invoco, Yo te invoco. Atiende a mi súplica, ¡Oh Gran Hermano Espíritu Guerrero. Con su Hacha, machete y flecha, te pido que vengas a eliminar, a destruir y a volver. Destruye toda forma de invocaciones, magia negra, brujería, hechizeria, maldiciones, que mis enemigos han puesto en mí. Con su hacha imploro que rompa todos los nudos, cadenas o enlaces que en mi nombre an puesto. Que todas las formas de sortilegio hecho en mi nombre y sin mi consentimiento se derumba. Su poder es inmenso y yo me presento a usted, con mayor respeto y reverencia. En el nombre de Dios, ayudame con este trabajo espiritual y les pido que destruia todos los obstáculos y eliminarlos de mi camino para que yo pueda ser liberado de todo mal y peligro. Indio de la Guerra tus poderes son inmensos, que son capaces de atar y vencer los malos pensamientos y los deseos de mis enemigos. Que todos los que quieren hacerme daño temen y respeten la protección de ti mi Indio que me acobija. Amén. I pray to the Father, to the Son and to the Holy Ghost. Oh Indio Bravo may you find elevation and may you find the peace in Spirit to overcome your earthly trials and tribulations. Oh Indio Bravo indomitable spirit, hear the supplication of I who invokes you that ask that you bless me with your courage and bravery to overcome the obstacles within my life. Oh valiant and brave Indian protect and guide me so that I may become brave and valiant in life in conquering all the obstacles, setbacks and find a solution to all my problems within this life. Help me Indio Bravo so that I can advance within life and so that I and all I love can live in peace; having the utmost faith that we are under your guidance and protection. Amen. Le Ruego al Padre, al Hijo y al Espíritu Santo. Oh Indio Bravo le pido a Dios que voz pueda encontrar la elevación y pueda encontrar la paz del Espíritu para que voz pueda superar sus pruebas y tribulaciones de la tierra. Oh Indio Bravo espíritu indomable, escucha la súplica de aquel que te invoca, te pido que me bendigas con su coraje y valentía para superar los obstáculos de mi vida. Oh valiente y valerosos Indio, protejame y guíame para que yo puede llegar a ser bravo y valiente en la vida y que yo pueda con su bendicion conquistar a todos los obstáculos y encontrar una solucion a todos mis problemas. 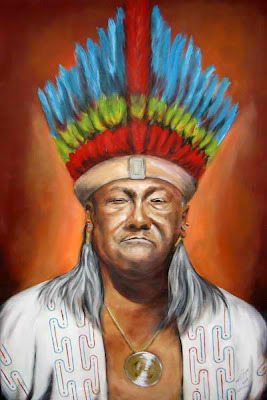 Ayúdame Indio Bravo para que pueda avanzar en la vida y para que yo y todo lo que yo valoro y amo pueda vivir en paz. Oh mi Indio al que le tengo una gran fe, estoy bajo su guía y protección. Amén. 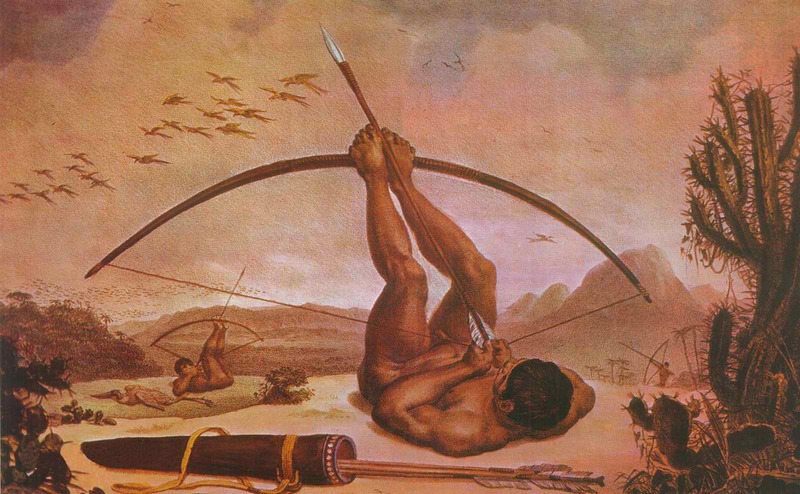 Hear me oh Commission of the Naborias, great Caciques and Indian Warriors. Oh Powers of the Seven Indian Spirits, I ask that you lend your ears and hear my supplication. Liberate me from injustice, liberate me from assaults and insults. Liberate me from hopelessness, weakness, confusion, and fear. Liberate me from diseases and illnesses. Liberate me from arms and weapons. Liberate me from those who wish me harm, my enemies. Liberate me from sorcery, and black magic. Shield me, guard me, protect me and keep me away and safe from those arms and weapons that may Pearce my skin and that of those I love. Shield me, guard me, protect me and keep me away and safe from all who wish to knock me down and lead me astray from my path. Oh Gran Indio Libertador assists and hear my petition and orison. Just as your Ancient Spirits heared your prayers and liberated your people before the complete genocide of your people, hear me and liberate me from all that wish to wane my spiritual progression. Amen. Oídme oh Comisión de las Naborías, grandes caciques y Guerreros Indios. Oh Poderes de las Siete Potncias Espírituales de los Indios. Les pido que presten sus oídos y escucha mi súplica. Liberarme de la injusticia, liberame de las angustias, agresiones e insultos. Liberarme de la desesperanza, debilidad, confusión y temor. Liberarme de las enfermedades y dolencias. Liberarme de las armas y los golpes. Liberarme de los que quieren hacerme daño. Liberame de mis enemigos. Liberarme de la brujería, hechizeria y la magia negra. Guardame, protegeme, y mantengame alejado y seguro de las armas que pueden penetrar mi piel y protege y ampare a mis seres mas querido Mantengame lejs de los que deseen tumbarme, arastrarme y desean llevarme por el mal camino. Oh Gran Indio Libertador escucha mi petición y oración y liberame de todo lo que desean disminuir mi progreso espiritual. Amén. I ask God Omnipotent to give everlasting light and elevation to the Spirit of El Indio Valiente. Oh Indio Valiente your earthly sacrifices where not in vain and have not fallen on deaf ears. Great Indian Spirit you who are the example of a valiant warrior and gallant soldier. In life you guarded your people until meeting an untimely and unjustified death, in spirit form I ask that you guard over me and my family. I invoke you, Oh Indio Valiente, with respect and admiration. Liberate me great Spirit injustice and malice. Guard over me and my family. This I humbly pray. Amen. Pido a Dios Omnipotente para dar a luz eterna y la elevación del espíritu de El Indio Valiente. Oh Indio Valiente sus sacrificios terrenales, no han caido en oidos sordos, ni fueron actos en vano. Gran Espíritu Indio, que sois el ejemplo de un valiente guerrero y valiente soldado. En la vida voz vigilaba a su gente hasta la reunión de su muerte prematura e injustificada. Te pido con mucha fe, que guarde y me protejes a mi y a mi familia. Yo te invoco, ¡Oh Indio Valiente, con respeto y admiración. Libera a mi espíritu de la injusticia y la maldad. Guarda sobre mí y mi familia y siempre te orare. Este es mi humilde oración. Amén. Our Father of Heaven, and Mother of Earth we ask that you guide the princesses Guanina and Alida into your Celestial Court. Let them be a beacon of light to your heavenly host. Oh Guanina and Alida great Taino Princesses I invoke you to fill my life with love and remove any obstacle that may hinder that blessed union. Free me of envious enemies and besiege them within themselves so that their blind rage or hatred not reach me. May they not locate me, May they not find me, May they not see me, May they not reach me. Give me the wings of a hummingbird so I may fly quickly away from them. And if they are to find me, let them see that I am surrounded by the Commission of Indian Spirits who guards and protects me and all I love. Let them not reach me with their hateful words. Let them not reach me with their confused thoughts. Let them not reach me with their plots. Let them not reach me with their deceitful plans. If they wish me harm, may it return to them threefold. Oh Princesses Guanina and Alida I humbly offer you the light of this candle, may it give you light and elevation. Amen. Oh Nuestro Padre del Cielo, y Nuestra Madre de la Tierra le pedimos que nos guíe a la Taina Cacica Guanina y la Princesa Alida a su corte celestial. Que sean un faro de luz para su hueste celestial. Oh Cacica Guanina y Princesa Alida gran Tainas de nuestro pueblo Borinquen, les invocp para que llenan mi vida con amor y eliminar cualquier obstáculo que pueda impedir que la bendita unión de mi espiritu llegue a el bendito faro de su luz. Líbrame de los enemigos envidiosos y atalos a ellos dentro de sí mismos para que ni su rabia o su odio pueda tener contacto a mi ser. Que con sus ojos no me vean, que con sus pies no me persigan, que con sus palbras no me ofendan, y que con su mantilla que me acobija no me encuentren. Dame las alas de un colibrí para que pueda volar rápidamente lejos de ellos. Y si por casualidad me encuentran que vean que estoy vajo la proteccion de la Comisión de los Espíritus Indios, que guarda y protege a mí y a todos los que amo. Que no me alcance con sus palabras de odio. Que no me alcance con sus confusos pensamientos. Que no me alcance con sus parcelas. Que no me alcance con sus planes engañosos. Si desean hacerme daño, que se le revuelva tres veces. Oh Cacica Guanina y Alida humildemente le ofrecemos la luz de esta vela, para que les dé luz y elevación. Amén. I offer you light and progress Great Cacicas Anacaona, Casiguaya, Doña Ines, Doña María, Guanina and Yuiza. Oh Great Taino Cacicas, in life you governed your people, often making choices that benefited them but at that time your choices or decisions were not recognized. But now we see that your choices where about the insurance and survival of your race and you have come to be venerated and respected and now you are seated within the heavenly thrones of your Celestial Courts. Oh Great Cacicas Anacaona, Casiguaya, Doña Ines, Doña María, Guanina and Yuiza. I invoke you with the great faith I have in your Indian Court, asking that you consider that which I humbly ask of you, and that I may come out victorious in all my undertakings. Bring to me allies and keep away enemies. Bring to me trust worthy allies and keep away those whose hearts and minds are full of lies and deceit. This I pray, Amen. Oh Indias Cacicas en el nombre de Dios te ofresco luz para su progreso Gran Cacicas Anacaona, Casiguaya, Doña Inés, Doña María, Guanina y Yuiza. Oh Gran Cacicas Tainas, en la vida sus opciones o decisiones no fueron reconocidos. Pero ahora vemos que sus era solo para la seguridad, y la supervivencia de su raza y ahora estan sentadas en el trono celestial de su atrios celestiales. Oh Gran cacicas Anacaona, Casiguaya, Doña Inés, Doña María, Guanina y Yuiza. Te invocamos con la gran fe que tengo en la Corte de la Indias Cacicas, pidiendo que se tiene en cuenta que lo que humildemente te pido, y que yo pueda salir victorioso en todas mis empresas. Tráeme a los aliados y mantengan lejos los enemigos. Este ruego, Amen. I ask for light and elevation in the name of the Father Yucahu who is in Heaven, the Mother Atabey of the Earth and Seas, the Son and the Holy Spirit. 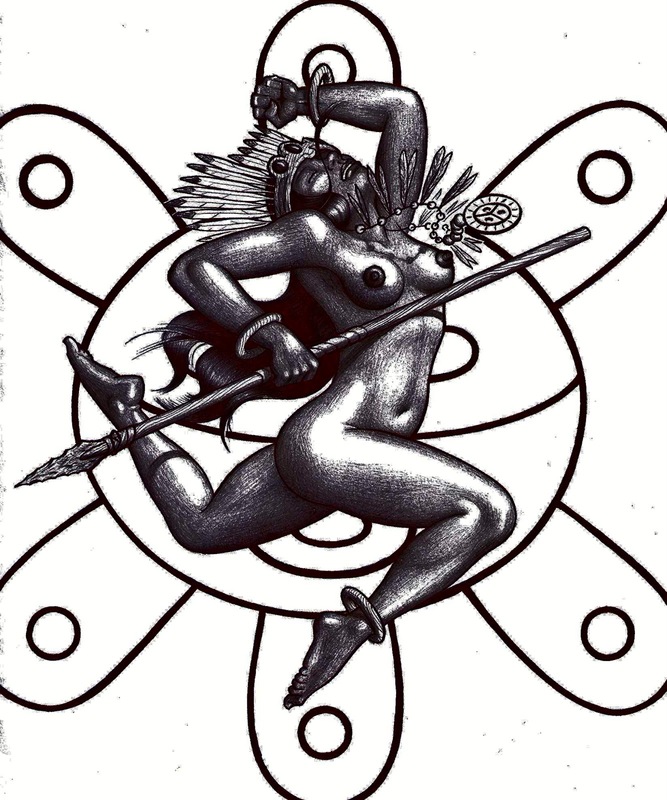 I come here and now to invoke the name of the Cacica Yuiza, she who held the title as the last Female Chief of her Taino people. Yuiza, you are known and called by many names, and each I hail. Yuisa, Hail Thee! Loaiza, Hail Thee! Luisa, Hail Thee! Loiza, Hail Thee! Yuiza with your great beauty you conquered the heart of Man, and gave, sacrificed and lost your life for the well being of your people. I come here now and light this candle in your honor, may your name be remembered always. Hail Yuiza and Glory be to the Father, Son and Holy Ghost. Amen. Pido Luz, Progreso, Amor, Fe, Ezperanza, Caridad, y la Elevación en el Santo Nombre de Yucahu Padre que está en el Cielo, la Madre Atabey de la Tierra y el Mar, del Hijo y del Espíritu Santo. Yo vengo aquí y ahora a invocar el nombre de la Cacica Yuiza, la que celebró el título como el último jefe Mujer de su pueblo Taíno. Yuiza, usted es conocido y llamado por muchos nombres, y sea alavado cada uno. Yuisa, te Salve! Loaiza, te Salve! Luisa, te Salve! Loiza, te Salve! Loiza Aldea, te Salve! Yuiza con su gran belleza, que conquistó el corazón del hombre, y le sacrifico y perdio su vida por el bienestar de su pueblo Borinqueno. Vengo aquí hoy para encender esta vela en su honor, para que su nombre pueda ser recordado siempre entre tu Pueblo Boriqua. Dios te salve Yuiza y Gloria al Padre, Hijo y al Espíritu Santo. Amén.